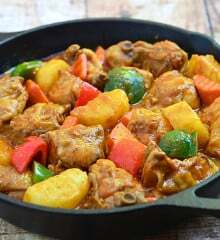 Coming from a country with average temperatures rarely below 80 degrees, it is interesting how we, Filipinos, have such a deep love affair with soups and stews. Along with the delicious array of tinola, nilaga and bulalo, chicken pochero is another example of the piping hot dishes we favor even in warmer weather. A legacy of 250 years of Spanish rule, this peasant’s stew is humble in its simplicity of preparation but hearty and satisfying with choice chicken, sweet saba bananas, potato chunks, chorizo pieces, legumes and fresh local produce. Enjoy! In a pot over medium heat, heat oil. Add bananas and fry until lightly browned. Remove from pan and drain on paper towels. Add potatoes and fry until lightly browned. Remove from pan and drain on paper towels. Remove excess oil except about 2 tablespoons. Add onions and garlic and cook until limp and aromatic. Add chicken and cook, stirring occasionally, until lightly browned and juices run clear. Add fish sauce and cook for another 2 to 3 minutes. Add tomato sauce and water and bring to a boil, skimming any scum that accumulates on top. Lower heat, cover and simmer until chicken is cooked. Season with salt and pepper to taste. Add potatoes and cook until almost tender. Add chorizo de bilbao, garbanzo beans and bananas. Cook for about 4 to 5 minutes or until heated through. Add green beans and napa cabbage and cook for another 2 to 3 minutes. Add pechay and cook for about 1 minute or until vegetables are tender yet crisp. Serve hot. chicken poachero Recipe is simple, easy to cook with available ingredients easy to find at home or nearby groceries. Agree 🙂 It’s easy, tasty comfort food. I am going to try your recipe this weekend, I’m just concerned that sometimes when I cook chicken there is a game-y smell to it (malansa) do you think I can add some ginger to your recipe? NICE PHOTOGRAPHY.RECIPE TO BE TRIED. I so enjoy the recipes that you share. I have already tried a couple of them. I would love to try them all when I have the luxury of time to cook for my family. I have noticed however that you have some giveaways?..any chance your fans here in the Philippines could join? Anyway, THANK YOU for helping me bring joy to our dinner table. After which he barely had time to react coz he was so into it. Thank you Miss L for sharing your sumptuous recipes! Thank you and good luck to the group,god bless.